Actually, birds gave up teeth to speed up egg hatching, a research paper published Wednesday suggests, challenging long-held scientific views on the evolution of the toothless beak. 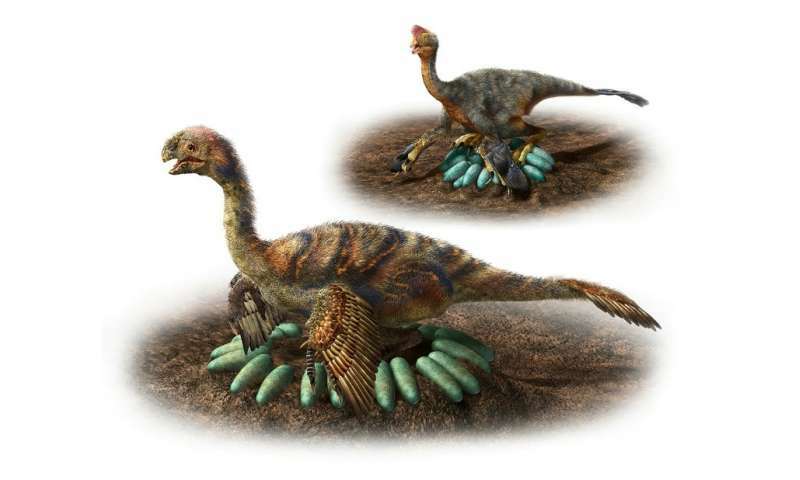 Compared to an incubation period of several months for dinosaur eggs, modern birds hatch after just a few days or weeks. This is because there is no need to wait for the embryo to develop teeth—a process that can consume 60 percent of egg incubation time, said researchers Tzu-Ruei Yang and Martin Sander from the University of Bonn. While in the egg, the embryo is vulnerable to predators and natural disasters, and faster hatching boosts survival odds. This would be a concern for dinos and birds—all egg layers. In mammals, embryos are protected inside the mother. "We suggest that (evolutionary) selection for tooth loss (in birds) was a side effect of selection for fast embryo growth and thus shorter incubation," Yang and Sander wrote in the journal Biology Letters. Previous studies had concluded that birds—living descendants of avian dinosaurs—lost their teeth to improve flight. But this did not explain why some non-avian dinosaurs in the Mesozoic era had independently evolved similar toothless beaks, said the duo. Other studies had concluded that beaks were better for eating bird food. But some dinosaurs with a very different, meat-eating diet had also discarded teeth in favour of pointed beaks. Yang and Sander said their breakthrough came from a study published last year, which found that the eggs of non-flying dinosaurs took longer to hatch than previously thought—about three to six months. This was because of slow dental formation, which researchers analysed by examining growth lines—almost like tree rings—in the fossilised teeth of two dinosaur embryos. 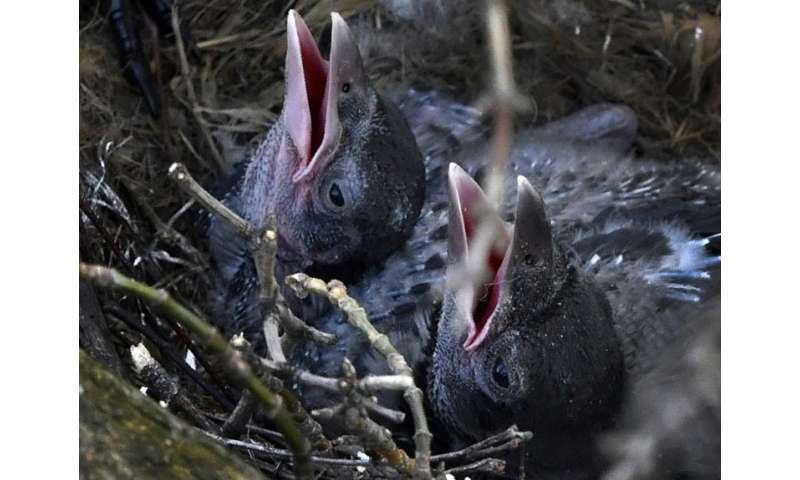 Faster incubation would have been aided by early birds and some dinos taking to brooding their eggs in open nests rather than burying them as of old, said the research team. They conceded their hypothesis was not consistent with toothlessness in turtles, which still have a long incubation period. If they evolved to loose their teeth so they could develop in the egg faster, why didn't they evolve to simply not start growing their teeth until AFTER they hatched from their eggs? Thus the said proposed 'explination' given by this link actually explains nothing. Long ago when they did have teeth they were conned by a fast-talking mammal into giving them up for the dentures he was selling. Yeah and loose teeth is an even greater evolutionary detriment than bad spelling. why didn't they evolve to simply..
How do you feed if you have neither teeth nor a beak? A toothless jaw is not an effective tearing or chewing tool, see baby humans. You're either being parented from birth by an animal with no molars, so no way they can chew food and spit for you - human weaning method before processed food mush. They may have a crop and crop stones and handle feeding by regurgitation like many birds do, but with a toothless jaw you run into the danger of choking. Beaked animals at least have some way of processing their food from birth - small advantages deliver over the long term. Or you're not parented at all. In which case you need to hunt from birth like a modern snake or crocodillian. Either way I think the evolutionary pressure favours a beak or teeth from birth if you are not a mammal. I also imagine a beak is just as effective as teeth with the added advantage it is less prone to damage, loss and infection. The teeth evolved first, then the beaks evolved WITH the beaks, and only then LATER did they evolved to loose their teeth. Thus at no time did they have both no teeth and no beak thus they never had a problem with feeding. The evidence for this is in the fossil records. "...Ancient bird with beak and teeth..."
the evolutionary pressure favours a beak or teeth from birth if you are not a mammal. The two not being mutually exclusive. Yes, that's interesting. I had pondered why some avian animals survived and others didn't. I recently read another article about this question and it seems the researchers concluded that tree dwelling avian would have suffered most in the mass extinction and the ground dwelling avian had a better chance of survival. So would it be reasonable to suppose that the Ichthyornis spending much time aloft over the sea was more likely to suffer as the tree avian? Ok to clarify I thought you were talking about an individual animal not the evolution of a species. I agree what the fossil record shows. If you look at what problems teeth present I think a toothless beak is a significant advantage over a toothed beak or toothed jaw even. Teeth are prone to breakage and infection which can and does lead to early death. I think dental hygiene is a significant factor in the deaths of many animals and until recently humans as well. Unless you have evolved infinitely growing or replacement teeth you will wear them out and when that happens you obviously starve and die. Beaks are also capable of greater dexterity than a toothed jaw, see tool use in birds. You can see in the avian and testudinoid lineages some extremely long lived species. I think beaks are fundamental to that ability.No genetic use in living 120+ years if you starve after 20 through tooth loss. Once you have evolved a beak, teeth became a drawback. haha how can you take anyone seriously when they have never learned the difference between lose and loose, even after being enlightened?? I mean, what other obvious idiocy have they been ignoring? You reject my assertions because I am a bad speller? -and my Englidelicious is perfect! Well, who knows eh? Maybe their teeth became loose too and fell out. Wish I had a $ for every spelling mistake I made...man I'd be rich. Yours was an easy mistake to make because the spelling checker doesn't kick in since lose and loose are both legitimate. Not worth worrying about, Ha! The health failings of teeth with age don't appear to have ended the evolutionary path for the many life forms that evolved to use them. Associated problems have not prevented the passing on of genetic material to offspring. For beaks to replace teeth, an advantage within the species has to emerge, and less time in the egg would be a prime candidate, since the advantage is realized before either the teeth or beaks are required by the surviving individuals. Higher early survival rate would drive downstream characteristics, even if teeth were far better for eating. This theory is undoubtedly original -... a bogus. Ironically for this theory many birds actually https://en.wikipe...gg_tooth inside egg shell just for to get easier way outside - but on the opposite side of beak. But many juvenile signs of young birds disappear later and new ones emerge during their maturing. If the teeth would be really crucial for birds, they could develop them anytime after hatching: but this doesn't happen. Bear with me as I'm just really thinking aloud. I just wondered if the influence came from the outside. Say, for example, once the eggs were laid perhaps the parent didn't wait for the chicks to do the hatching but did the job herself. Would that be possible? Of course that assumes the parent would know when the appropriate time had arrived. So perhaps not feasible after all, eh? Oh well..
@Mimath224: Thinking is indeed rare on this site, but what https://imgs.xkcd...ory.png? Yeah, seen that one before, Ha! What does it imply...the last negation would suggest perhaps the influence did come from outside the egg but perhaps in the form of dino-birds losing teeth through some process which inhibited their growth in later generations. A long proboscis jaw-like structure bearing teeth probably became unsuitable in certain habitats especially for the smaller avian. Or am I thinking too much? I haven't read the paper, but the way they constructed their hypothesis makes it sensitive to selection bias, since they used age as a "test" as well - and indeed they cannot explain turtles. However I don't think the hypothesis is bad, the simplest way to suppress early teeth is to lose them.